I came home from work yesterday to find that a tornado had hit my living room — a 40-lb canine tornado. We keep a blanket tucked into the couch cushions to protect the leather from puppy claws. Even though Alba’s not allowed on the couch we have no illusions that she follows those silly rules when we’re not home. So much for the blanket. It was 90% off the couch. My Scottish wool throw blanket that goes on the back of the couch was on the floor with a hole in it. No pillows remained on the couch. 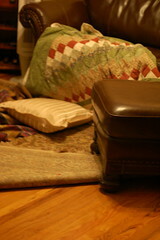 And most perplexing, the area rug was folded back, and the ottoman was actually on top of the folded part. I can’t even imagine the activities that led to that. I’m surprised Truffle was still standing. I take it she’s recovered from her visit to the snip clinic last week. I think it’s safe to start walking her again.